(2012.088.21, Oklahoma Historical Society Photograph Collection, OHS). The seat of Delaware County, Jay is located at the junction of State Highways 59 and 20. The town is atypical in Oklahoma history because of the way in which the site and layout were specifically located and platted as a county seat. At 1907 statehood the new county's only sizable community was a settlement named Grove, which had grown up around Grove Springs. The town already supported a newspaper, the Grove Sun, and a railroad branch terminal. Despite Grove's location at the county's extreme northern edge, state officials designated it as the county seat. Because of the poor road conditions, residents of the southern part of the county resented traveling thirty miles, which took two days in a horse-drawn vehicle or even in an automobile, to conduct their legal business. In July 1908 resentment led citizens to form the Delaware County Improvement Association. At the first meeting, chaired by farmer and rancher E. C. Wilfred and held at Muskrat Springs, the group stated their mission to move the county seat to Delaware's center. A survey team hired to pinpoint the exact location selected land belonging to Thomas Oochalater, a full-blood Cherokee. Acquiring title to a full-blood's allotment would require a lengthy federal legal procedure, the committee shifted their attention to the allotment adjoining Oochalater's on the east, a parcel belonging to committee member Claude L. "Jay" Washbourne. As a mixed-blood Cherokee, Washbourne was exempt from the federal restrictions hindering the alienation or sale of his land. He immediately gave ten acres on which to construct a town. The Delaware County Improvement Association appointed him the townsite committee's chair. The association platted the town, reserving a central block for a courthouse. The committee quickly constructed a frame building and then applied to the U.S. Postal Service for a post office, submitting the required three town names. These were "Center," "Jay," and "Washbourne." Postal authorities chose Jay for its brevity. The group petitioned Gov. Charles Haskell to call an election to locate the county seat. The choices consisted of the nonexistent Jay or the already-established Grove. The election was held December 8, 1908, one year after statehood. Grove residents overwhelmingly voted against the relocation. Around the county 798 favored Grove, and 896 favored Jay. Before the county records could be moved, however, Grove residents appealed to the Oklahoma State Supreme Court to have the election set aside, citing that Jay had not existed on the election date. On June 28, 1911, the court issued a ruling that the election was legal. Grove leaders again appealed. Complicating matters further, William J. Creekmore bought property north of the new town, which he developed. He built a two-story, concrete courthouse and offered to donate it to the county. After the court rejected a second appeal by Grove residents, officials refused to move the county records. Jay residents appealed to Gov. Lee Cruce, who sent a unit of the Oklahoma National Guard to force the move. A standoff developed between the guard and the county sheriff, who had deputized a force of seventy-five men. Before the issue was settled in 1914, a fire of suspicious origin destroyed two temporary wood-framed courthouses in Jay. The county records were moved five times between Grove, Jay, and the Creekmore building, ultimately finding a permanent home in 1918 at a new, native limestone structure situated on the Jay town square. Even in the late 1930s during the construction of the Grand River Dam and the Grand Lake O' the Cherokees in the northwestern corner of the county, Jay's population never exceeded fifteen hundred. In 1939 the town officially incorporated. The usual service stores comprised the business community. The area's economy depended on timber, farming, and stock raising. State, county, and school system employees garnered the largest payrolls. Jay's first federal census, taken in 1940, found 741 residents. The number rose to 1,120 in 1960. In 1980 the population had grown to 2,100. With a population of 2,582 counted by the 2000 census, Jay has benefited from Delaware County's phenomenal growth from sixteen thousand to more than thirty-six thousand residents during the previous two decades. While the town's timber and agricultural income have dropped, government (county, state, and federal) and school payrolls have steadily climbed. A chicken-processing plant and other new businesses are beginning to attract outside investment. The town also derives income from recreation and tourism at nearby Grand Lake. The area's quality of life has attracted many retirees. In 1998 Jay citizens secured a county-wide, four-year, half-cent sales tax and raised more than $4 million to rehabilitate the county's eighty-year-old courthouse while preserving historical architecture. In 2003 the city maintained a home rule charter form of government. The 2010 census reported 2,448 people living in Jay. In 1967 business leaders established the Huckleberry Festival. This event, sponsored by the chamber of commerce, is held each year during the Fourth of July holiday, with activities ranging from a parade and arts-and-crafts displays to a carnival and turtle races for children. In 1977 the local Polson Cemetery (NR 77001092), burial place of Stand Watie, was listed in the National Register of Historic Places. "Courthouse Chronology," Heritage of the Hills: Magazine of the Delaware County Historical Society 22 (Fall 1998). "The Founding of Jay, Family Papers, Maxine and David Washbourne," Heritage of the Hills: Magazine of the Delaware County Historical Society 26 (Spring 2003). Grove (Oklahoma) Sun, 11 December 1908. 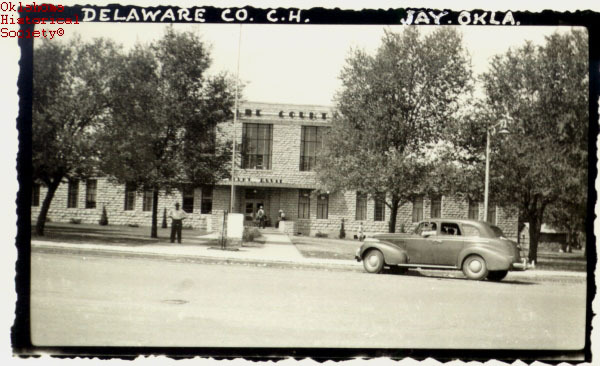 Heritage of the Hills: A Delaware County History (Jay, Okla.: Delaware County Historical Society, 1979). Muskogee (Oklahoma) Times-Democrat, 12 December 1912. Dale Denney, "Jay," The Encyclopedia of Oklahoma History and Culture, https://www.okhistory.org/publications/enc/entry.php?entry=JA014.